Quantum computing has long dangled the possibility of superfast, super-efficient processing, and now search giant Google has jumped on board that future. New Scientist reports that Google has spent the past three years developing a quantum algorithm that can automatically recognize and sort objects from still images or video. The promise of quantum computing rests with the bizarre physics that occurs at the subatomic level. 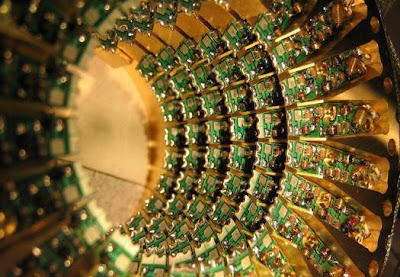 Different research teams have worked on creating quantum processors that store information as qubits (quantum bits), which can represent both the 1 and 0 of binary computer language at the same time. That dual possibility state allows for much more efficient processing and information storage. To take an example cited by Google, a classical computer might need 500,000 peeks on average to find a ball hidden somewhere within a million drawers. But a quantum computer could find the ball by just looking into 1,000 drawers -- a nice little stunt known as Grover's algorithm.